but unfortunately there are several myths in the public’s mind that exaggerate the benefits of recycling and lull the consumer into the belief that if they recycle their trash they are eliminating the environmental impact of their consumption. The highest priority should be not to make things that are not needed such as much of the packaging that surrounds the items we purchase. The second word in the slogan “reduce, reuse, recycle”, calls for reusing the item without having to expend the energy to remake it. Refillable bottles are the prime example of this tactic. The move away from refillable bottles was one of the worst decisions of the late 20th century in terms of sustainable living. If neither of those options are possible than recycle the material and make new products out of it. Unfortunately, with the exception of aluminum and glass, recycled material is not made into the same product that was recycled. Plastics used in bottles (PET and HDPE) changes chemically when it is reheated so it is rarely made back into bottles but ends up as clothing or substitutes for wood decking. In other words the material only gets one more use. According to the Pacific Institute, in 2006 17 million barrels of oil were used just to make the PET bottles for bottled water. Even if 100% of them were recycled rather than the 27% that actually are recycled in the US, the 17 million barrels of oil would only be used twice, and there would also be energy consumed to re-melt the bottles into its next use. Recycling plastic keeps the bottles off the street, and gives the material a short reprieve from the landfill, short that is in terms of the lifespan of the plastic in the landfill. 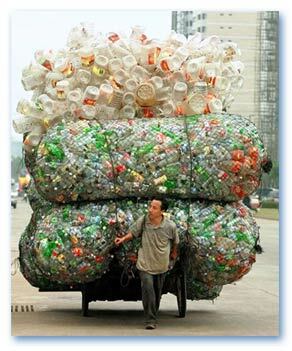 The other myth is that other kinds of plastic can be recycled. In fact only PET and HDPE (No. 1 and No. 2 on the label) are recycled. Only about 1% of the remaining categories recycled. Many of the plastics are mixtures that cannot be recycled. Others change chemically into undesirable compounds. Bottles can be made to be refilled. Plastic can be developed that can be melted and reformed into the same product numerous times. Other forms of packaging can be used. If we can enact laws that require companies to be responsible for the cost of reprocessing their products, much of this problem would go away very quickly. Packaging and plastic bottles would either become reusable, or be made of material that can be recycled easily. More complex items like computers would be constructed to enable the separation of valuable parts and reuse other parts. Paper recycling has been quite successful with the recycling rate in 2009 reaching 63%, though the increase from the 2007 rate of 56% was due to a decrease in the amount of paper produced. Recycling of paper saves trees energy and pollution. Resources are still consumed, however, in the form of energy, and virgin pulp that needs to be added to most products to compensate for the shortening of the fibers each time paper is recycled. Paper is recycled into paper of lower quality each round and can only be recycled a limited number of times. According to the EPA, the average office worker in the United States uses 10,000 sheets of paper in a year. The vision of the paperless office is still a distant fantasy. Is all that paper necessary?